Reading and share top 12 famous quotes and sayings about Liking Things by famous authors and people. Browse top 12 famous quotes and sayings about Liking Things by most favorite authors. 1. 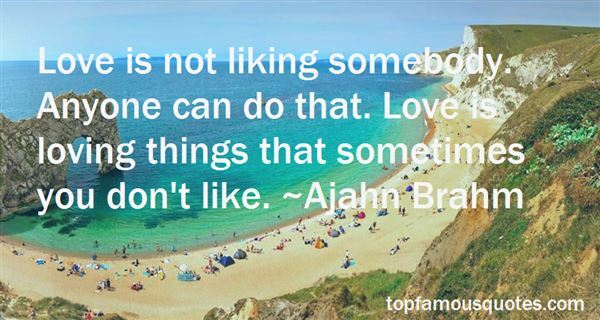 "Love is not liking somebody. Anyone can do that. Love is loving things that sometimes you don't like." 2. "I remember liking Betty White a lot. It was one of those things as a little child actress, you get inspired by experienced actresses and actresses that reach out to you." 3. "But surely liking the same things for dinner is one of the deepest and most lasting things you could possibly have in common with anyone,' argued Dr. Parnell. 'After all, the emotions of the heart are very transitory, or so I believe; I should think it makes one much happier to be well-fed than well-loved." 4. "But "Uncle Gussie"- my mother's brother, A. W. Hamilton- talked to me as if we were of age. That is, he talked about Things. He told me all the science I could then take in, clearly, eagerly, without silly jokes or condescensions, obviously liking it as much as I did...I do not suppose he cared for me as a person half so much as Uncle Joe did; and that (call it an injustice or not) is what I liked. During these talks our attention was fixed not on one another but on the subject. His Canadian wife I have already mentioned. In her also I found what I liked best- an unfailing, kindly welcome without a hint of sentimentality, unruffled good sense, the unobtrusive talent for making all things at all times as cheerful and comfortable as circumstances allowed..."
5. "Reuven listen to me. The Talmud says that a person should do two things for himself. One is to acquire a teacher. Do you remember the other. ""Choose a friend," I said."Yes. You know what a friend is, Reuven? A Greek philosopher said that two people who are true friends are like two bodies with one soul. "I nodded. "Reuven, if you can, make Danny Saunders your friend. ""I like him a lot, abba.""No. Listen to me. I am not talking about only liking him. I am telling you to make him your friend and to let him make you his friend." 6. "Which maybe that's what love was: liking someone how he was and doing things to help him get even better." 7. "But from that moment on, Hermione Granger became their friend. There are some things you can't share without ending up liking each other, and knocking out a twelve-foot mountain troll is one of them." 8. 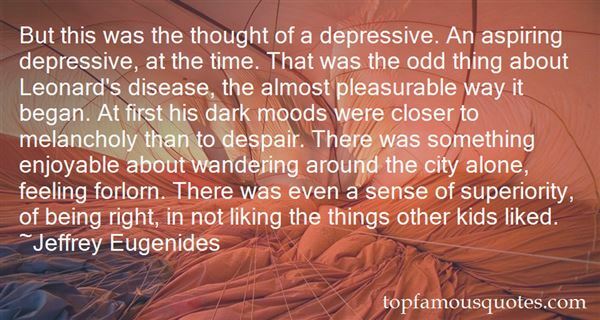 "But this was the thought of a depressive. An aspiring depressive, at the time. That was the odd thing about Leonard's disease, the almost pleasurable way it began. At first his dark moods were closer to melancholy than to despair. There was something enjoyable about wandering around the city alone, feeling forlorn. There was even a sense of superiority, of being right, in not liking the things other kids liked." 9. 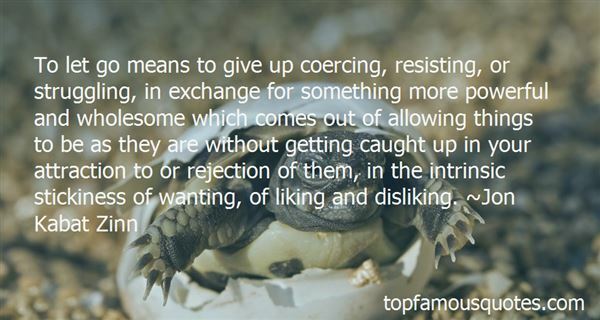 "To let go means to give up coercing, resisting, or struggling, in exchange for something more powerful and wholesome which comes out of allowing things to be as they are without getting caught up in your attraction to or rejection of them, in the intrinsic stickiness of wanting, of liking and disliking." 10. "I was being sincere. Hold on to it as long as you can, Lark. Life knocks the stuffing out of youeventually. Look at me. Look at Cade. As long as things are simple, keep them that way. As long asunrequited liking is the least of your worries . . . it's not so bad. ""It feels bad. ""I know. Take comfort in the fact that that actually makes you pretty normal. ""Not comforted. "He laughed. "That's normal too. ""Shut up. ""Love you too." He didn't say it often enough. But it had never been easy for him to say.That earned him a smile. "I do. Love you, you know. Thanks for trying. And thanks for . . . beingwilling to kill someone for me. ""It's what brothers are for. 'Night"
11. "There's no more film. Film is gone. We photograph digitally and electronically. We don't really use film the same way anymore - it's disappearing little by little. Things change. We have to change with them. There's no point in liking or not liking it. It is what it is." 12. "I'm sick of doing bad things and liking it and then wondering what's wrong with me. I want it to be over. I want to start again." Part of your job as an artist is to push yourself and make sure your creative juices are flowing."